The pre-start intro of Konami’s SD Snatcher (consisting of Strange Overture, Another Bad Accident and Difficult Move) has been one of Wolf’s projects for years already. In fact it had been finished in 2016, it just wasn’t exported and mixed yet. Now it is! Compared to Wolf’s typical arrangements, this one is unique in that it was made using one software synthesizer only. FM8, to be exact, some of you may have known Wolf’s FM8 remixes for years. So, the SCC and PSG sound palette is now represented by an FM sound palette, with added filtering and effects. The result itself hasn’t changed a lot compared to the original though, not a lot of harmonies were added, mostly because the genre of music didn’t require such. Difficult Move has some added brass stacks and a proper ending. The other parts have some decorations and layers, but that’s about it. Brace yourself for more to come, soon! Very, very beautiful tune, Wolf and John! Thanks a lot for your efforts and predilection for our Wonderful System. I don't know the original, but this one sounds great. Congrats. Blasphemy! 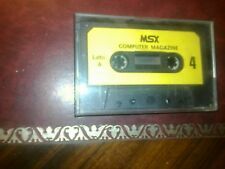 In terms of channels vs audible result it's probably the most efficient piece of music on MSX and should be on everyone's drool-list. I mean, if you listen to 3:36 - 3:51 in my version, and if you ignore the drums and the brass hits, the fundaments of the music only use three channels! That's why it turned out so great: Konami had a further five channels to decorate the basic three channels.